Politics and economics strive for the ideal case of a lively, well-functioning market or competition. If such a market exists, this promotes innovation and a good price-performance ratio for consumers and customers. A very good example of this is the Swiss telecom market, which was liberalized in 1998. In 1997, the telecommunications monopolist PTT became Swisscom, which was exposed to the free market in 1998. 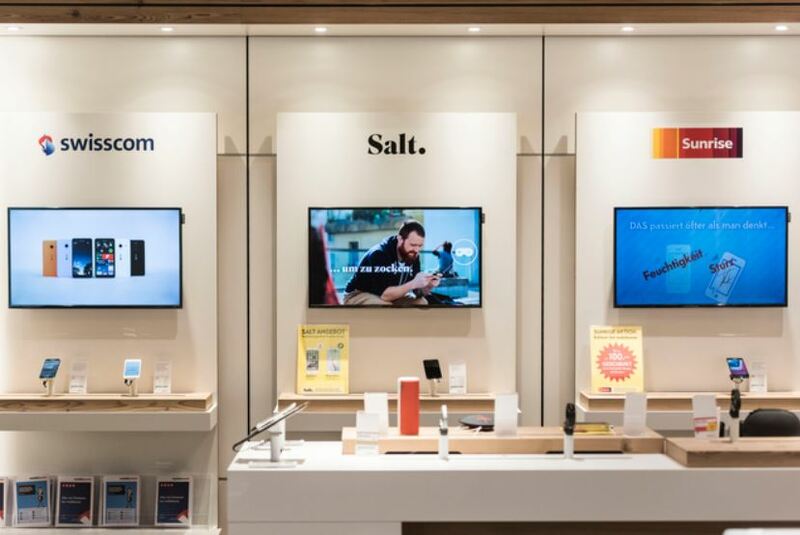 Even though the liberalization has created relatively little competition for Swisscom, this has led to enormous innovation over the past 20 years and thus to a significantly better price-performance ratio in the Swiss telecom market (see Berner Zeitung 01.10.2017 What 20 years of liberalization have brought customers). The legal tool for achieving or at least promoting this competition is competition law, consisting of the tools antitrust law, supplemented in Switzerland with the price supervisor, and fair trading law. It is the task of antitrust law (CartA) to prevent competition from cooling down, in particular as a result of cartels and mergers. Antitrust law therefore aims to fuel competition. In Switzerland, the Competition Commission (CC) is responsible for supervising and enforcing antitrust regulation. Article 1 CartA already states that only practices that are harmful to the market are not permitted under antitrust law. On the basis of this principle, it may even be that a cartel is assessed as permissible by the WEKO, although it restricts the market because it has effectively no negative, even positive effects on the market. This has long been claimed, for example, by the Swiss book cartel, in which publishers fixed book prices with booksellers. The proponents of the cartel argued that the generally higher prices tended to promote a diverse book market because publishers and booksellers were able to cross-subsidise books that were less successful but enriched the book offering (e.g. poetry, expensive photo books) with overly expensive bestsellers. The WEKO banned the book cartel in 1999. In a referendum held in 2012, the people rejected the reintroduction of the book cartel by means of a federal law on fixed book prices (see www.bk.admin.ch/ch/d/pore/va/20120311/index.html). Pursuant to Art. 2 CartA, the antitrust rules apply to the conduct of all companies under private and public law. A company is defined as any buyer or supplier of goods or services in the economic process, irrespective of its legal or organisational form. The law generally distinguishes between three essential cases of cartelistic conduct. Agreements restricting competition pursuant to Art. 4 para. 1 CartA and Art. 5 CartA are legally enforceable or not enforceable agreements as well as concerted practices of companies of the same (horizontal agreements; common “cartel”) or different (vertical agreements) market levels which have the object or effect of restricting competition. If such agreements exist, it is presumed by law that the market will be effectively eliminated. However, the market participants concerned can prove that this is not the case because the agreements have positive effects on the market (economic efficiency, Art. 5 et seq. CartA; see also the case of the book cartel above). Companies with a dominant market position pursuant to Art. 4 para. 2 CartA are subject to the permanent risk of abuse within the meaning of Art. 7 CartA (see below). Single or several enterprises are considered to be market-dominating enterprises if they are in a position to act to a significant extent independently of other market participants (competitors, suppliers or consumers) on one market as suppliers or consumers (Art. 4 para. 2 CartA). According to Art. 7 CartA, market dominance is not inadmissible, but its abuse. 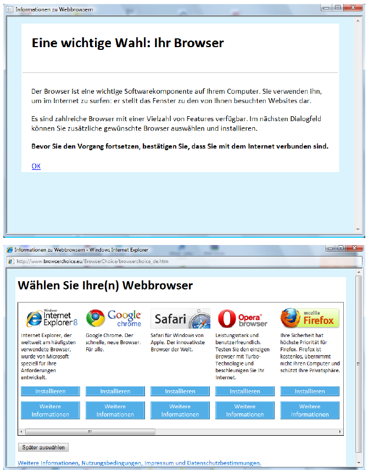 An illustrative example of abuse of a dominant position is the case of Microsoft’s Internet browser. Even though the market share of the Microsoft operating system has declined in recent years, at the end of 2017 Windows is still running on over 90% of desktop systems (see e.g. www.borncity.com). Because Internet browsers are also installed via the operating system as a gateway to the Internet, the EU Commission obliged Microsoft in 2009 to set up a popup when installing the Windows operating system, in which the user is given the option of installing one or more browsers other than or alongside the Internet browser “Internet Explorer” from Microsoft. In 2013, the EU Commission determined that Microsoft had not or not sufficiently fulfilled this requirement and imposed a fine of 561 million euros (sic!) on Microsoft on the grounds that Microsoft had abused its market power in the area of operating systems and Internet browsers (see e.g. Spiegel Online 06.03.2013 EU imposes a fine of 561 million euros on Microsoft). Mergers constitute the third case under antitrust law. According to Art. 4 CartA in conjunction with Art. 9 CartA requires mergers with a certain turnover volume to be notified to the competition commission (CC). Subsequently, the CC examines whether the same merger restricts competition to the detriment of demanders or suppliers (see above). If this is the case, the CC can either prohibit the merger or allow the merger under certain conditions. An interesting example of this is the purchase of the retail trade company Denner by the retail trade group Migros. In 2007 the CC agreed to this merger to the astonishment of many, but under certain conditions, in particular Migros and Denner were obliged to procure the goods intended for resale separately. The CC essentially based its positive decision on the fact that competition in the retail trade, in particular from the numerous foreign suppliers who are already active in the Swiss market or will be active in the future, was so great that the merger of Migros and Denner had no significant or negative effect on this competition. This has obviously been confirmed by developments since 2007, with retail prices in particular falling all the time. (see in addition info WEKO 04.09.2007). If there is a suspicion of an infringement of the Cartel Act, this provides for three possible proceedings. Firstly, affected market participants may, pursuant to Art. 12 ff. CartA against the presumed injured party before a civil court. However, the CC may also bring an action on its own initiative or following a complaint pursuant to Art. 18 et seq. CartA may open administrative proceedings. Within the framework of this administrative procedure, the CC itself can issue sanctions against cartelistic behaviour. And these have it in them! In the case of inadmissible restrictions of competition, the fines can amount to up to 10% of the turnover of the last three years in Switzerland. In particular, actual criminal sanctions pursuant to Art. 54 et seq. CartA are provided for for violations of orders of the CC. Price agreements have long since ceased to take place only in smoky back rooms, and companies are increasingly forming cartels in the digital realm as well. Airlines, for example, have voted on air fares via a database. Or travel agencies have used software as a messaging service to coordinate behaviour between different companies. In another case, companies coordinated sales of posters via Amazon and agreed on prices using algorithms. Cartels are therefore increasingly shifting to the Internet. The advance of artificial intelligence also increases the danger that self-learning algorithms will collude tacitly on prices. The NZZ journalist Natalie Gratwohl has written the following very interesting article: NZZ 28.08.2018 When algorithms form cartels. Where antitrust law does not succeed in maintaining sufficient competition or competition at all, or where there can be no competition or no competition makes sense (natural monopolies, e.g. the SBB rail network), the price supervisor comes into play (see www.preisueberwacher.admin.ch). The legal basis of this authority is the Price Supervision Act (PSA). The price supervisor takes action against price abuse if prices on the relevant market are not the result of effective competition. Effective competition exists in particular when customers have the possibility to switch to comparable offers without considerable effort. The price supervisor carries out its activities in cooperation with the CC and cooperates and co-ordinates with it. The price supervisor primarily seeks an amicable solution with the companies concerned. If this does not succeed, the price supervisor can decide on the matter. His decisions can then be referred to the Federal Administrative Court. The task of unfair competition law (UCL) is to prevent strong competition from leading to unfair practices on the part of market participants. Fair trading law therefore aims to cool competition. The Unfair Competition Act (UCA) is a result of the principle of good faith already laid down in Art. 2 of the Civil Code Book (CC) and applies it specifically to the business sector. The UWG deals with good faith in business transactions. There is no (state) authority to supervise and enforce fair trading regulations, as in antitrust law the competition commission does. However, the Swiss advertising and PR industry has self-regulation (so-called “soft law”; rules not enforceable by the state; see below). Since 1966, the industry has been the sponsor of the Foundation of Swiss Advertising for Fairness in Commercial Communication, to which all major organisations in the Swiss communications industry belong. The executive body of the Foundation is the Swiss Fair Trading Commission. It has established principles for fairness in commercial communication. 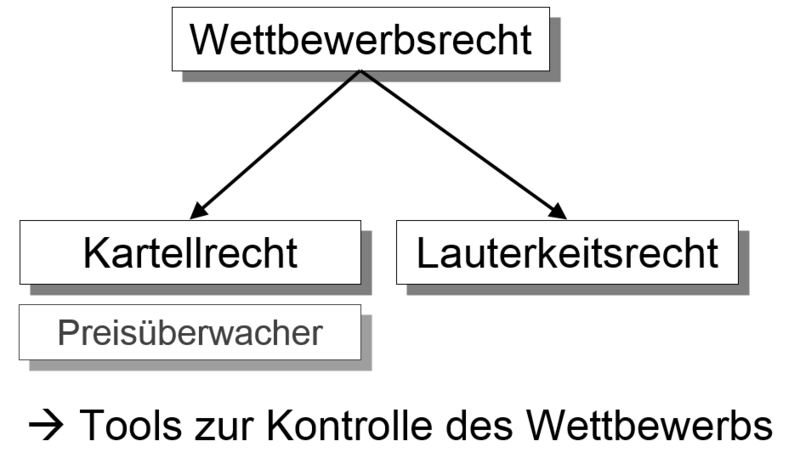 These principles can be downloaded from the website of the Fair Trading Commission: www.faire-werbung.ch or www.lauterkeit.ch. Any person who considers commercial communication to be unfair is entitled to complain to the Fair Trading Commission. The Commission consists of three chambers in which consumers, media professionals and advertisers are equally represented. The Swiss Fair Trading Commission does not issue any judgements that can be enforced by the state. It issues recommendations with the aim of ensuring that these are implemented by advertisers in the future and that the legal risks of legal actions or criminal proceedings before state authorities can be avoided. However, the Swiss Fair Trading Commission recommendations are feared by companies as they scratch their reputation. The principles of the Fair Trading Commission and its recommendations do not differ significantly from fair trading law. 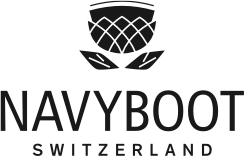 They give concrete form to them, in particular for various specific types and areas of communication, which is particularly valuable when there are relatively few judicial decisions on unfair competition law in Switzerland, in particular those of the highest courts. In the international context, reference can be made to the standards of the International Chamber of Commerce (ICC) for fair commercial communication, the Code for Advertising and Marketing Communication Practice, which can be downloaded from the ICC website: iccwbo.org/publication/advertising-and-marketing-communication-practice-consolidated-icc-code. It should be noted that international business standards are generally becoming more important. They simplify international commercial cooperation because they are universal and not territorial. The Unfair Competition Act is structured in such a way that Art. 1 UCA first states the purpose of the law, namely to guarantee fair and undistorted competition in the interest of all parties involved. This article is never quoted in practice. Then comes the core of the law, the fundamental article Art. 2 UCA This can generally be applied to all unfair conduct, provided that Art. 3 et seq. of the Unfair Competition Act does not contain any special provisions. In practice, therefore, one usually searches in advance for a suitable special offence in Art. 3 et seq. of the Unfair Competition Act. If no such one is found, one can still apply the basic article Art. 2 UCA to the facts of the case. The practical problem with the application of Art. 2 UCA is that its violation is not punishable under Art. 23 UCA, i.e. does not permit criminal proceedings (see also 08 Protection of digital products against innovation → Enforcement of intellectual property rights). In Art. 9 ff. UCA then lists the legal remedies. Civil proceedings are generally possible here. If there is a special offence pursuant to Art. 3 et seq. of the Unfair Competition Act is given, a penalty may also be imposed pursuant to Art. 23 et seq. UCA also allows criminal proceedings to be instituted. The fundamental article Art. 2 UCA presupposes two conditions for the application of fair trading law, which must be cumulative, i.e. both must exist simultaneously. First, there must be a deception and/or an act against good faith. Secondly, the unfair conduct must influence the market. The injured party must also participate in the market in order to be affected at all and to be able to take legal action. In Art. 3 et seq. of the Unfair Competition Act (UCA), the legislature lists examples of unfair conduct, special offences which (in contrast to the fundamental article Art. 2 UCA) may be prosecuted under Art. 23 UCA not only in civil proceedings but also in criminal proceedings. In the following, the special facts of particular relevance to the digital world are examined. Pursuant to Art. 3 para. 1 lit. o UCA, anyone who sends mass advertising without a direct connection to a requested content (fax, SMS, e-mail, automatic telephone calls) or arranges for such mailings to be sent without obtaining the prior consent of the customer, indicating the correct sender or pointing out the possibility of refusal without problems and free of charge is acting unfairly. On the other hand, anyone who receives contact information from customers when selling goods, works or services and points out the possibility of refusal does not act unfairly if he sends these customers mass advertising for his own similar goods, works or services without their consent. According to this article, two important principles apply when sending faxes, text messages, e-mails and automatic telephone calls (calls made by a machine and not by a person; i.e. telemarketing is generally allowed). The opt-in principle means: in particular, no commercial e-mails and SMS messages to addressees who have not previously given their explicit consent via another channel (e.g. subscription to a newsletter via a website) or who are not already customers. According to the opt-out principle, addressees must also always be able to unsubscribe from sending e-mails by simply clicking on the appropriate button in the e-mail or in the SMS (“Unsubscription”). Not the law, but the industry associations also demand the so-called double opt-in as best practice, in which the addressee receives an e-mail or SMS at the end of the process after registering to receive e-mails or SMSs, in which he has to explicitly agree again by clicking on a corresponding link. This procedure prevents third parties from wantonly subscribing to newsletters or the like. Current practical examples are described under the following link in the blog “Juristenfutter”: NAVYBOOT sends illegal SMS wp.me/p8RKnD-7d. Clear and complete information about the identity of the provider and its contact address, including that of the electronic mail; i.e. both a physical and an online address. Indication of the individual technical steps leading to the conclusion of a contract, e.g. by means of a timeline of the process. Technical means by which input errors can be detected and corrected before the order is placed. Immediate confirmation of the customer’s order by electronic means. In the European Union (EU), the Directive on Consumer Rights (Directive 2011/83/EU, “Consumer Rights Directive”) and the Directive on Electronic Commerce (Directive 2000/31/EC, “E-Commerce Directive”) contain rules on online commerce. In some cases, EU regulations go further than Swiss regulations. From a Swiss perspective, these regulations must be observed if consumers in EU countries are also addressed with corresponding online offers (impact principle/marketplace principle; see below). Right of withdrawal: In principle, the customer may return a product within 14 days of receipt. Terms of payment, delivery and service as well as delivery date. Possible duration of the contract and cancellation conditions: The relevant information must be provided. If no other agreement has been made, the delivery period is a maximum of 30 days. Clear information: In addition to the seller’s contact details, the most important characteristics of the product or service must be disclosed. The total price, including all taxes and levies, must also be stated. Costs that cannot be calculated in advance must be indicated and the method of price calculation explained. Warranty: The statutory warranty is at least two years. During this period, the consumer may request repair or replacement of the defective product. Should this fail, withdrawal from the contract or reimbursement of the reduced value is possible. General Terms and Conditions: The consumer must be able to retrieve and save the GTC upon conclusion of the contract. Order button: The button for the final order confirmation must be labelled with the words “order subject to payment” or another unambiguous wording. In cartel law, as well as in fair trading law, the so-called impact or market place principle applies. This means that the rules are applied in the market on which the corresponding behaviour of a market participant has an effect. This applies both to Switzerland (e.g. Art. 2 para. 3 CartA) and generally also internationally. This means that if the economic activities of a German company have an influence on the Swiss market, Swiss antitrust and/or unfair competition law applies to this German company or its conduct. The same applies in the opposite direction. If, for example, Swiss companies are active in the EU, EU antitrust law applies to them in particular. This was felt, for example, by the Schindler lift group as part of proceedings before the EU Commission. Schindler had to pay a fine of 143.7 million euros in the EU for its participation in a lift cartel (see NZZ Online 18.07.2013 Schindler loses cartel dispute with the EU in the final instance).